"Prepare for a journey like none other. Join Kathryn Taubert as she takes you on an intimate ride through a very personal, moving and heartbreaking tale. Strap yourself in as she chronicles the day-to-day details of watching her husband suffer from a debilitating disease. Struggle to stay aboard as you hope this story will have a happy ending and beg for mercy that the ride will soon be over as Taubert makes you realize that some doctors were all any patient could want, while others were there for the paycheck. Come to the realization the author has been through this before. Travel with her through depression, smile as newfound friends give her a reason to laugh again and be overjoyed as she finds an entirely new life in her 60's that she never thought possible. As you get ready to disembark, find yourself agreeing as you realize that it truly is better to have loved and lost than never to have loved at all." PRAISE FOR KATHRYN'S BOOK, "YEVU (WHITE WOMAN): MY FIVE WEEKS WITH THE EWE TRIBE IN GHANA, WEST AFRICA:" "Expect tears. Expect smiles. In essence, expect to be overwhelmed with pleasant emotions as you take your first steps into another world altogether as Kathryn Taubert, your willing and enthusiastic tour guide, transports you to a magical place like no other. While on your journey with the author, you will experience -- as she did -- what life is like for the people in Ghana, West Africa, along with their culture, environment and living conditions. Fall in love with the unique, touching characters you will meet along the way and join Kathryn as she shows you what it is like to find yourself on essentially another planet ... one that you'll never be able to forget." MUSIC CRITIC'S REVIEW OF CLAIR DE LUNE FROM CD "SOMEWHERE IN TIME"
"I'll give kudos to this one" (Kathryn's original lyrics and vocals in Clair de Lune). "It's a really nice piece," states Blasick. "The arrangement is lovely...the mood is well-set and maintained." Blasick is a well-known movie music producer and performer with many credits to his name, including the score of the movie "The Grass Harp," among many others. "GALVESTON NATIVE UP FOR JAZZ AWARD"
Galveston native Kathryn McDonald Taubert put aside jazz singing for a practical day job years ago, but now at age 62, she’s singing again, and nominated for an International Jazz Award. Four songs from her first CD release, at age 61, have catapulted her into the company of musicians the likes of Michael Buble and Herbie Hancock at the awards to be televised next month from Beverly Hills. It’s all very humbling and hopeful. "With a voice like an instrument," says D&M Sr. Producer, Dave Warren, "Kathryn Taubert has once again demonstratedincredible versatility in her latest CD, "Somewhere In Time." Kathryn's original lyrics to songs "Claire de Lune," "Some Other Sunset," and the title song, "Somewhere In Time," are beautiful, haunting stories of love not to be missed in this new CD, available from her website, D&M Records, or CDBABY.com." Featuring 12 tunes from Latin to Swing, Kathryn once again sings in several languages, introducing us this time to her French version of the lovely tune, "I Wish You Love." "Elegant, eloquent, and the Real Deal....honest, right-on...I get emotional about new singers in a good way...this particular one grabbed me. I think she's classic, classy...What a voice...Everybody is in a different zone when they hear a voice like that...Lady Kathryn, you're wonderful, you really are."" "She is a rare talent with some of the most beautiful songs to grace a stage in a long time," said company co-founder Dave Warren. "D and M is proud to have this amazing talent as part of our family of fine musicians." "When someone sees a ...5 as a score in a certain category...it's a validation from a pro.....Well done!!" (Kathryn's CD, "Where Can I Go Without You?" received Mr. Foley's highest possible ratings in all 9 categories, with greatest strengths in "lead vocals and song selection." "Nice song selections on this CD. Nice sound and pleasant mood right from the top...Mellow and melodic...Strong vocal performance with good pitch...very pleasant vocal quality and it's a pleasure to listen to. Strong production and musicianship all around." We are pleased to announce that you have been selected as a winner of D and M Music’s Jazz Fest 2008 compilation CD." This exciting CD, which will be distributed to major Jazz festivals throughout the 2008 festival season, features 15 of today's best new Jazz musicians with fresh, exciting music." " A friend sent me a copy of this new CD by singer Kathryn Taubert, since I've been complaining that Diana Krall is a genre of 1. Well now it's a genre of 2. "We certainly enjoyed your music... One Note Samba" ("Samba de Uma Nota So") has been selected for inclusion in D&M's compilation CD of 15 new Independent Artists. Great job!" This compliation CD, "New Horizons" is now available on the D & M website, "Music Store" link. 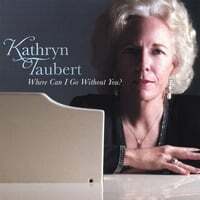 "This CD, 'Kathryn Taubert: Where Can I Go Without You?' has a lot of things in it that are perfect. Let me tell you a few of them that make me happy. Kathryn has a perfect vibrato. You've never heard one quite this good. She knows how to express a song. And this is the first time in I can't remember when that I've heard a three musician combo that actually knows the art of accompaniment. My favorite...is the first cut, 'When October Goes' Four and a half minutes of greatness.... If you are a light jazz fan, this is one you should have in your collection."